"An Italian version of stir-fry, this tasty dish mixes cubed, boneless chicken and penne pasta with red and green peppers, garlic, tomatoes, oregano, and basil for an easy weeknight supper." Bring a large pot of lightly salted water to a boil. 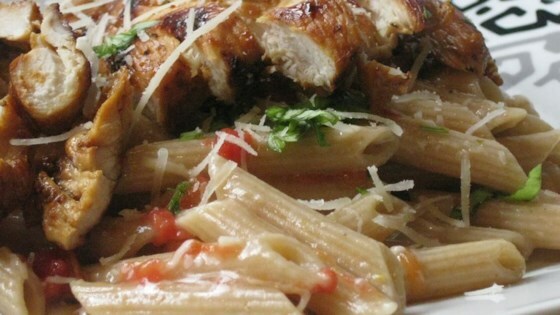 Add the penne pasta and cook until al dente, 8 to 10 minutes. Drain, and reserve pasta. Whisk the cornstarch and chicken broth together in a bowl until smooth. Set aside until needed. Heat the olive oil in a skillet over medium heat. Add the garlic and chicken; stir and cook until the chicken is no longer pink and juices run clear, about 10 minutes. Stir in the onion, and green and red peppers; cook until tender, about 5 minutes. Stir in the tomatoes, and simmer for 10 minutes. Pour in the chicken broth mixture and wine, if desired, and season with oregano and basil. Stir in the cooked pasta, and simmer over medium heat until thoroughly heated through, about 5 minutes. Serve garnished with Parmesan cheese.